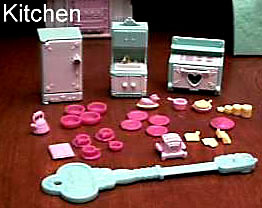 Description: This is a set of kitchen furniture and accessories designed to be used with #5166 Magic Key Mansion or other Precious Places® sets. This set includes a stove, sink, and a refrigerator that has a metal door that can be opened with the accessory magnetic key. The set also includes several tiny accessory pieces that are so small that many were probably lost the first day that the set was opened. These tiny accessory pieces few fall into the "hard-to-find" pieces catagory. This set was designed for children ages 5 years and older. FPT6713 - White rectangular refridgerator with a paper litho picture inside of shelves full of food, and a glass of ice under an icemaker. The front 2 left corners of the refridgerator have small pegs with a hole in the center to attach the refridgerator door. The back of the refridgerator has molded coiled "tubes" near the top, and a molded motor and mouse at the bottom. Marked "©'88 F-P, MACAO" on the back. Measures 2-1/16" tall, 1-1/4" wide, 1" deep. *See "Variations" below. FPT6714 - Pink rectangular refridgerator door with a round metal door knob that can be moved with a Precious Places® magnetic key. The door has raised heart designs on the front corners, and the back of the door has molded refridgerator shelves. Measures 1-15/16" tall, 1-1/16" wide, 1/4" deep. *See "Variations" below. FPT6715 - Small pink oven/stove with a white paper litho range on the top with 4 burners and a grill (litho may be missing). The stove has a small shelf above the range, and a rectangular hole under the range for the oven. The front bottom corners have small pegs with holes on the inside to attach the FPT6716 oven door. The top 2 corners have raised molded hearts. Marked "©'88 F-P, MACAO" on the back. Measures 1-5/8" wide, 1-9/16" tall, 1" deep. *See "Variations" below. FPT6716 - Flat white rectangular oven door with a wide raised handle across the top, a heart shape cut out in the center, and raised molded heart designs on all 4 corners. Measures 1-3/8" wide, 3/4" high. FPT16869 - Aqua green sink and overhead cabinet unit, and a cabinet under the sink. This unit has a rectangular hole in the center of the counter top to add the FPT6843 sink. The wall above the sink area has a square "tile" pattern. The cabinets above the sink have 2 pretend molded cabinet doors with a small door knob on each door. The top of the cabinet unit has a rounded design with a heart shape in the center and a round ball on top. The area under the sink has an open area to place the 2 FPT6845 cabinet doors. The back left side of the sink unit has a slit hold to place the FPT6846 towel bar. Marked "©1989 FISHER-PRICE, MACAO" on the back. Measures 2-1/2" tall, 1-1/16" wide, 7/8" deep. FPT6843 - White rectangular single sink with 2 faucet knobs for hot and cold on top, and a hole between them to attach the FPT6844 faucet. The sink has a rectangular recessed hole with a round molded circle outline on the bottom for the "drain hole". Measures 7/8" wide, 5/8" deep, 3/8" high. FPT6844 - Tiny J-shaped pink sink faucet with a round faucet on the end, and a ring on the other end that has a small peg on the end to fit into the hole on the FPT6843 sink. Measures 3/8" high, 5/16" wide, 1/8" deep. *See "Variations" below. 2 each - FPT6845 - Square white cabinet door with a raised round knob on one side. One end of the door is rounded with a tiny peg on the top and bottom to fit on the FPT16869 sink cabinet. Measures 1/2" wide, 1/2" high, 1/8" thick. FPT6846 - Tiny pink towel bar with a wide raised rounded handle on one side, and a wide connector peg on the other side that slides into the slit on the back left side of the FPT16869 sink unit. Measures 1/2" wide, 3/16" high, 3/8" deep. *See "Variations" below. FPT6847 - Yellow rectangular hard plastic towel that has a C-shaped clamp on the top back to attach to the FPT6846 towel bar on the FPT16869 sink unit. The towel has a terrycloth texture on the front with a raised "PP" imprint for "Precious Places®". Measures 9/16" high, 5/16" wide, 1/8" deep. *See "Variations" below. FPT6848 - Square yellow hot mat with a loop on one corner (no hole in loop). The hot mat has a square pattern imprint on both sides. Measures 3/8" square (not including the hanging loop). *See "Variations" below. FPT6849 - Pink hot glove with a raised heart shape in the center of one side of the glove. The glove has a squared imprint design on both sides. Measures 3/8" wide, 1/2" long, 1/16" thick. 4 each - FPT6718 - Tiny round dark pink coffee cup with a tiny squared handle on one side. Measures 3/8" diameter (not including the handle) and 1/8" high. *See "Variations" below. 4 each - FPT6719 - Small flat round dark pink coffee cup saucer with a slight raised edge on the top sides, and a tiny slightly raised edge on the bottom. Measures 1/2" diameter. 1-1/16" thick. *See "Variations" below. 4 each - FPT6720 - Tiny round dark pink bowl with raised edges on the sides, and a tiny slightly raised edge on the bottom. Measures 9/16" diameter, 3/16" deep. *See "Variations" below. 4 each - FPT6721 - Small round dark pink plates with a slightly raised heart imprint in the center, a wide raised edge on the sides, and a slightly raised edge on the bottom. Measures 5/8" diameter, 1/8" thick. *See "Variations" below. FPT6717 - Small round light pink pie that is rounded on top and hollow on the underside. The top has 4 molded flower designs with an X in the center, and heart designs between each flower. The pie has pie crust scalloped edges on the outer edge. The bottom has a slightly raised rim. Measures 11/16" diameter, 1/4" high. *See "Variations" below. FPT6850 - Tiny yellow oval-shaped dish with a wide riased edge on the top side. The FPT6851 chichen-shaped topper fits on top of this dish. Measures 5/8" long, 3/8" wide, 3/16" deep. *See "Variations" below. FPT6851 - Yellow oval-shaped chicken-shaped topper with a top half of a chicken on top (head and top half of body). The bottom has a raised oval-shape to allow the chicken to fit on top of the FPT6850 or FPT6869 oval-shaped dish. Measures 5/8" long, 1/4" wide, 3/8" tall. *See "Variations" below. FPT6852 - Small round yellow frying pan with a thin short handle on the side. The pan has a slightly raised edge on the sides and a small round removable lid. Pan measures 1/2" diameter with a 1/4" long handle on the side, 1/8" deep. FPT6853 - Small round yellow frying pan lid that has a half-circle raised handle on the top, and a slightly raised round center piece on the bottom to help stay attached to the FPT6852 frying pan. Measures 7/16" diameter, 1/4" high. *See "Variations" below. FPT6854 - Tiny round yellow cooking pot with a thin short handle on the side. The pot measures 3/8" diameter with a 1/4" long handle on the side, and 1/4" deep. FPT6855 - Pink tea pot with a rounded handle on top that is thicker and textured in the middle. The tea pot has a short pouring spout on the side, and tiny heart-shaped imprints around the sides. The pot has an attached lid on top with a tiny round handle on the tip top. Measures 1/2" long, 7/16" wide, 5/8" high. *See "Variations" below. FPT6856 - Pink rectangular muffin tray that holds 6 muffings. The tray has 6 raised round muffin tops on the top side and a raised molded heart shape on each end of the tray. The bottom side has 6 raised muffin cup bottoms. Measures 5/8" long, 1/2" wide, 1/8" deep. *See "Variations" below. FPT6857 - Yellow sugar and spice containers with 4 round containers ranging from large to small molded together side-by-side. All 4 containers have round permanently attached lids on top with a tiny round knob on the top center of each lid. The containers have tiny heart-shaped imprints on the sides. Measures 1" long, 1/4" wide, 5/16" tall. *See "Variations" below. FPT6858 - Pink toaster with 2 yellow handles (one on each end) and 2 pieces of yellow toast in the toaster. When the handle is moved up, the toast in the toaster will move up. When the handle is moved down, the toast in the toaster will move down. The toaster has a squared base with a short round leg on each corner. The sides of the toaster have raised molded heart designs. Measures 11/16" long, 11/16" wide, 5/8" tall. *See "Variations" below. FPT6859 - Aqua magnetic key with a magnet on one end and a handle on the other end. The handle is marked "Precious Places®" on one side and has nothing on the other side. Marked "©'88 F-P MACAO". Measures 5-1/2" long, 1-5/8" wide, 1/4" thick. FPT6860 - Aqua rectangular refridgerator with a paper litho picture inside of shelves full of food, and a glass of ice under an icemaker. The front 2 left corners of the refridgerator have small pegs with a hole in the center to attach the refridgerator door. The back of the refridgerator has molded coiled "tubes" near the top, and a molded motor and mouse at the bottom. Marked "©1989 FISHER-PRICE, MACAO" on the back. Measures 2-1/16" tall, 1-1/4" wide, 1" deep. FPT6861 - White rectangular refridgerator door with a round metal door knob that can be moved with a Precious Places® magnetic key. The door has raised heart designs on the front corners, and the back of the door has molded refridgerator shelves. Measures 1-15/16" tall, 1-1/16" wide, 1/4" deep. FPT6862 - Small aqua oven/stove with a white paper litho range on the top with 4 burners and a grill (litho may be missing). The stove has a small shelf above the range, and a rectangular hole under the range for the oven. The front bottom corners have small pegs with holes on the inside to attach the FPT6716 oven door. The top 2 corners have raised molded hearts. Marked "©1989 FISHER-PRICE, MACAO" on the back. Measures 1-5/8" wide, 1-9/16" tall, 1" deep. FPT17189 - Tiny J-shaped yellow sink faucet with a round faucet on the end, and a ring on the other end that has a small peg on the end to fit into the hole on the FPT6843 sink. Measures 3/8" high, 5/16" wide, 1/8" deep. FPT17190 - Tiny yellow towel bar with a wide raised rounded handle on one side, and a wide connector peg on the other side that slides into the slit on the back left side of the FPT16869 sink unit. Measures 1/2" wide, 3/16" high, 3/8" deep. FPT17191 - Pink rectangular hard plastic towel that has a C-shaped clamp on the top back to attach to the FPT6846 towel bar on the FPT16869 sink unit. The towel has a terrycloth texture on the front with a raised "PP" imprint for "Precious Places®". Measures 9/16" high, 5/16" wide, 1/8" deep. FPT17193 - Pink oval-shaped chicken-shaped topper with a top half of a chicken on top (head and top half of body). The bottom has a raised oval-shape to allow the chicken to fit on top of the FPT6850 or FPT6869 oval-shaped dish. Measures 5/8" long, 1/4" wide, 3/8" tall. FPT6865 - Tiny round light pink coffee cup with a tiny squared handle on one side. Measures 3/8" diameter (not including the handle) and 1/8" high. FPT6866 - Small flat round light pink coffee cup saucer with a slight raised edge on the top sides, and a tiny slightly raised edge on the bottom. Measures 1/2" diameter. 1-1/16" thick. FPT6867 - Tiny round light pink bowl with raised edges on the sides, and a tiny slightly raised edge on the bottom. Measures 9/16" diameter, 3/16" deep. FPT16867 - Small round light pink plates with a slightly raised heart imprint in the center, a wide raised edge on the sides, and a slightly raised edge on the bottom. Measures 5/8" diameter, 1/8" thick. FPT6864 - Small round dark pink pie that is rounded on top and hollow on the underside. The top has 4 molded flower designs with an X in the center, and heart designs between each flower. The pie has pie crust scalloped edges on the outer edge. The bottom has a slightly raised rim. Measures 11/16" diameter, 1/4" high. FPT6870 - Square pink hot mat with a loop on one corner (no hole in loop). The hot mat has a square pattern imprint on both sides. Measures 3/8" square (not including the hanging loop). FPT6869 - Tiny pink oval-shaped dish with a wide raised edge on the top side. The FPT6851 chichen-shaped topper fits on top of this dish. Measures 5/8" long, 3/8" wide, 3/16" deep. FPT6871 - Small round pink frying pan lid that has a half-circle raised handle on the top, and a slightly raised round center piece on the bottom to help stay attached to the FPT6852 frying pan. Measures 7/16" diameter, 1/4" high. FPT6872 - Yellow tea pot with a rounded handle on top that is thicker and textured in the middle. The tea pot has a short pouring spout on the side, and tiny heart-shaped imprints around the sides. The pot has an attached lid on top with a tiny round handle on the tip top. Measures 1/2" long, 7/16" wide, 5/8" high. FPT6873 - Yellow rectangular muffin tray that holds 6 muffings. The tray has 6 raised round muffin tops on the top side and a raised molded heart shape on each end of the tray. The bottom side has 6 raised muffin cup bottoms. Measures 5/8" long, 1/2" wide, 1/8" deep. FPT6874 - Pink sugar and spice containers with 4 round containers ranging from large to small molded together side-by-side. All 4 containers have round permanently attached lids on top with a tiny round knob on the top center of each lid. The containers have tiny heart-shaped imprints on the sides. Measures 1" long, 1/4" wide, 5/16" tall. FPT17192 - Pink toaster with 2 pink handles (one on each end) and 2 pieces of pink toast in the toaster. When the handle is moved up, the toast in the toaster will move up. When the handle is moved down, the toast in the toaster will move down. The toaster has a squared base with a short round leg on each corner. The sides of the toaster have raised molded heart designs. Measures 11/16" long, 11/16" wide, 5/8" tall. 1989 - Sold in a 8-3/8" long, 10-3/8" high, 2-1/2" deep box. 1990 - Sold in a 7" long, 7" high, 2-1/2" deep box.